You can really have fun with hands in fashion illustration. Gone are the days of always hiding them behind a fashion figure’s back or slipping them into pockets. 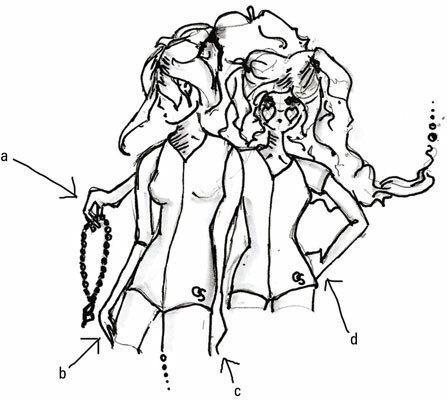 Instead, try some fluid and playful styles. After you master a few classic or playful poses, you can use them for every type of fashion look. To draw hands in proportion to the rest of your figure, use your head — literally. If you open your hand and place it over your face, you see that your hand is almost the same size as your face. An open hand should not be wider than the oval of your face. When you hold your wrist at chin level, the top of your hand ends a little past your eyebrows. So a hand should be a little shorter than the height of the oval for your head. For fashion drawing, realism is not required. You can draw obviously fake or unrealistic hands, depending, of course, on what you’re accenting! You don’t always need to draw each finger and nail; simply draw a few lines to get the point of the hand across. Think of the lower part of the arm as the gateway to the hand. The arm is slim and tapering down to the important wrist bone — the arm is the tiniest where the wrist starts. Don’t ignore the wrist bone. If you do, you end up drawing an arm that pours onto the hand without definition. The result is a chunky, unfashionable look. 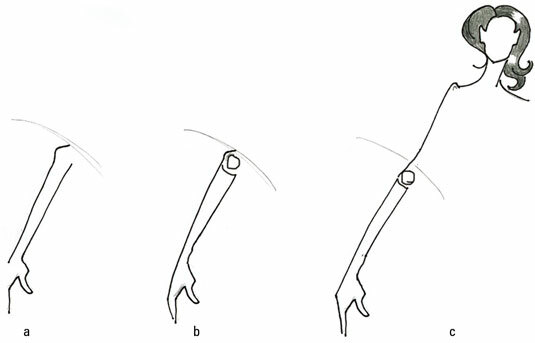 Draw the arm from the elbow to the wrist. Make sure that the arm tapers in at the wrist. Add a small curve to show the wrist bone. Attach the forearm to an upper arm and the rest of your figure. When it comes to drawing a lady’s hands, we have good news for you: One hand position works for many classic fashion poses. You can use this single pose of the hand for holding a little clutch or a tube of lipstick or for resting the hands on the hips. Keep drawings of the hands simple and light: no shading or hand creases allowed! Adding shading or lines creates the appearance of an older hand. You want your fashion model to be hip and youthful. For the palm, draw an oval on the diagonal. For the fingers, attach a triangle at the top of the oval. Sketch in a simple thumb, starting it about halfway down the oval. Create fingers from the triangle shape, rounding out the front of the shape into two long tube shapes. Feel free to add a little nail at the end of each finger for drama. Add the slim wrist with a wrist bone. Drawing a guy’s hands requires a somewhat different approach from drawing a woman’s. As with a lady’s hand, a guy’s hand isn’t as realistic as a figure drawing. However, you can’t be as fun and flirty as you would be drawing a woman’s hand, either. Give the dude’s hand a bit more of a squared-off form when you draw it. In fashion illustration, a guy is usually strolling down a runway or city street; he rarely carries fashion extras like women do. So most guys’ hand positions are relatively similar from drawing to drawing. For the palm, lightly sketch a loose and simple rectangle. Add a few curved lines for fingers and begin to round out the palm. Attach a curved oval shape for a thumb and further round out the hand. Lengthen the wrist and add a wrist bone. When drawing kids’ hands, follow the same steps you would for a man’s hand, but keep the hand and fingers shorter and stubbier.